Directions: From Honolulu take the Pali Highway (Rte 61) towards Kailua. As you reached the highest point on the road, pull into the lookout parking. You will have to pay for parking here. 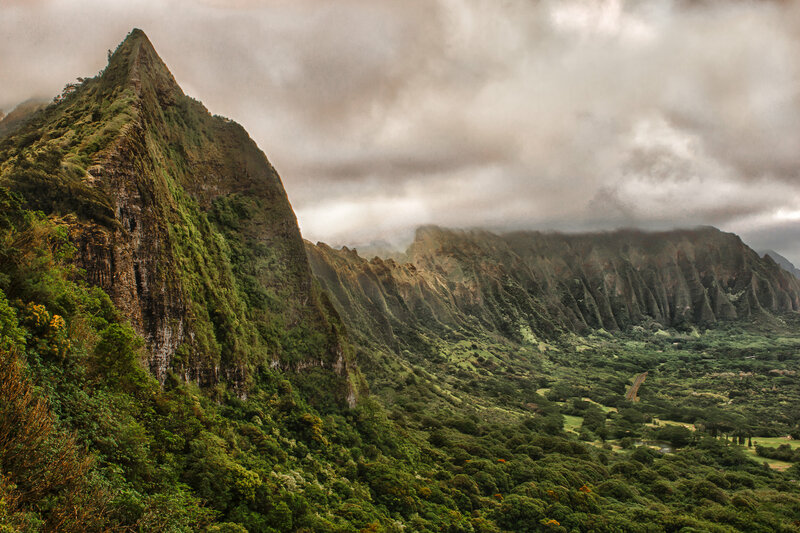 The Pali lookout is a historically significant place on the island of Oahu. This is the place that the Battle of Nuʻuanu was fought bringing Oahu under the reign of King Kamehameha I. Be prepared for strong winds as the trade winds are funneled through this natural funnel. Hold onto your hat. From the parking lot walk to the wall overlooking the valley below. The views are beautiful and offer great panoramic vistas. However, the best photo spot (imho) is a few steps away. Facing the wall overlooking the valley below and the town of Kailua you will see an old road leading downhill to the right. There is a wrought iron gate – go through that and continue down the road as it makes a sharp left turn. After a short distance you will see a beautiful view of the Koolau mountain range curving around to the right as shown in these pictures. 1) I would recommend the use of a tripod. If your tripod has a hook on it, weight it down with something heavy like a backpack, especially if the wind is blowing strongly. 2) Use a wider angle lens – I used a 26mm focal length. 3) Alternatively, you could shoot a panorama, possibly doing some compression with a shorter focal length. 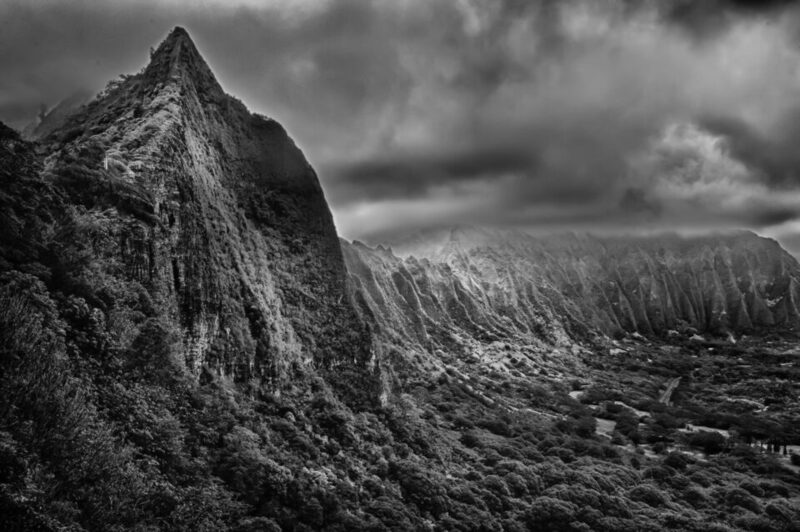 This is a beautiful image and it illustrates the story I am currently trying to tell in “The Hawaiian History Moment” on Mana‘o Hana Hou radio (FM 91.7) and in the companion booklet “The Hawaiian History Moment, Tides of Change in Hawai‘i, Vol. 2 Issue 7) put out by the Story of Hawai‘i Museum in the Queen Ka‘ahumanu Center on Maui as part of our educational program. If we can use your picture, how would you like the credit to read? I can be reached at 808-633-2140 or [email protected].